Think that's breaking the laws of physics? You should see the sport they play in there. "Aren't you surprised by how we got water to blatantly ignore gravity?" [Beat] "What?!?! You think it is easy altering the laws of physics, like gravity?!?!? How 'bout you try?!?" Water works in a pretty simple way. Water flows wherever gravity takes it, and water takes the shape of its container. Or Does It? Floating Water is the strange fictional occurrence in which water decides to defy gravity, and sometimes make a plethora of shapes. There can be any number of explanations that can be made by the people using this trope, but it really all boils down to the Rule of Cool. Remember however, it can still be in a glass container of some sort, just expect it to be crystal clear and barely noticeable. Goku from Dragon Ball Z exercises himself when he is in a hospital bed by concentrating his will on the water in a glass, moving the water out of the glass while it remains in the same shape as the glass. Naturally, when someone entered the room, he became distracted and the water fell on his head. Happens in Pokémon Ranger and the Temple of the Sea. During a performance by a water and psychic Pokémon show, giant spheres of water are levitated, with Pokémon and people jumping into them and swimming around. Speaking of Pokémon, Manaphy is living water. The Noiseman anime short has this. Juvia, being a water mage, makes regular use of this with her spherical 'Water Lock' spell. She can also liquify herself, so to a certain extent she is floating water. In the Grand Magic Games arc Lucy and Juvia go up against women in other guilds inside one of these. Aqueduct (a.k.a. Water Wizard), a villain in the Marvel Universe, has the psychokinetic ability to control and shape all forms of liquid (including oil) for virtually any effect, such as rainstorms, floods, tidal waves, water slides, and mobile animated water creatures. During the Ego Trip in With Strings Attached, John causes a fifty-foot stretch of river to rise up and stream over his head so the others can cross without struggle. Everyone is mightily impressed—except the Hunter, naturally. Tangled Up In Blues: Seafoam demonstrates her telekinesis by "dividing the water in the fountain into cubes that float through the air." In the climatic battle of Harry Potter and the Order of the Phoenix, Dumbledore momentarily nabs Voldermort inside a sphere of water and levitates it into the air in a spell reminiscent of the water cage that looked like a sheet of glass he uses for the same purpose in the book Harry Potter and the Order of the Phoenix. Star Trek (2009): The Red Matter. Justified in they had to have it suspended in a vacuum, because if it touched any other kind of matter at all it would turn into a black hole. The Mon Calamari opera/dance/thing in Star Wars Episode III: Revenge of the Sith. Justified in the movie Antz. Water really does that at that scale. The water tentacle from The Abyss. Richard Kelly is obsessed with this image. Watch any movie he directed, from Donnie Darko to Southland Tales to The Box. In The Last Airbender, The Heavy Admiral Zhao is killed in a curb stomp battle when three unnamed waterbenders simply trap him in a ball of water and suspend him until he drowns. Played for literal tearjerker effect in Gravity. We realise the heroine is crying when her tears start floating in bubbles through the microgravity of the Soyuz capsule. Note this is for Rule of Drama as in real life Stone's tears would not have formed free-floating tear spheres. The liquid's surface tension would make them cling to her skin or eyelashes. Pirates of the Caribbean: On Stranger Tides: Water creeps up walls and drips up off leaves near the Fountain of Youth. Justified, or at least Hand Waved, in Larry Niven's The Integral Trees and The Smoke Ring: "Ponds" in the setting are spheres of water floating in midair, due to the near-complete lack of gravity. In Percy Jackson and the Olympians, the title character moves and suspends water multiple times throughout the series. Also justified in one of Poul Anderson's Dominic Flandry novels, although the zero-g environment was artificial in this case. In The Colour of Magic, when one of the Krullian hydrophobes falls onto a pond, his innate revulsion for water manifests magically and pushes it away from his body, leaving him suspended over a trough in the liquid's surface. In the Spellsinger series, the river Sloomaz-ayor-le-Weentli is a "double" river, in which one river flows at ground level and another underground, with an air-filled space between them (A Wizard Did It). In Waters of Aqnis there is a chapter dedicated to a crazy captain telling his crazy story. Included in said story is an entire ocean of floating water, hovering just above the usual one. God separated the waters of the Red Sea, opening up a dry path on the seabed for the Israelites to pass on. Less impressively, but still something, the waters of the Jordan, twicenote once in Joshua 3 and once in 2 Kings 2. In one of the Simon Black novels by Ivan Southall, the Australian Ace Pilot travels into outer space and finds himself with the problem of how to take a bath in zero gravity. Eventually he slips into the huge glob of floating water and wriggles around until he's clean. An episode of Star Trek: Voyager has a planet made entirely out of water, the reason for that being it was held together by a massive force-field generator at its core. The people living on the planet meanwhile believed their gods had given it to them as a gift (note: they lived underwater in buildings). In the Doctor Who episode "Smith and Jones," the gravity-transport beam the Judoon use to transport the hospital from the earth to the moon causes water to condense out of the air around the hospital and fall upward, creating the illusion that it's "raining backward." Cleo from H2O: Just Add Water has the power to manipulate the form of water and mold it into a different shape. She can mystically create more water to form a "branch" from a small cup. Several "hydrokinetic" characters in the Global Guardians PBEM Universe commonly manipulate water in this fashion. The Forgotten Realms setting in had a spell called "Laeral's Aqueous Column," which created a column of water that was 10 feet high per caster level and 10 feet wide. 1st Edition has a lot of Bible-derived cleric spells, including "Part Water" and "Raise/Lower Water". Toa of Water in BIONICLE are able to manipulate water. Particularly skilled ones are able to keep it suspended in mid-air for extended periods of time, or mold it into unusual shapes such as a hand. Centaur Man's level in Mega Man 6 has a room where reverse gravity water is moving up and down on the ceiling. To get across without the Jet Adaptor, you have to time your jumps to have the gravity-reducing water increase your jump distance. Fan-made Super Mario 63 has water that can cling onto walls. They even lampshaded it in one particular level. The second and third game of Ecco the Dolphin had floating tubes and spheres of water. The computer game Aquaria has water bubbles suspended in air. 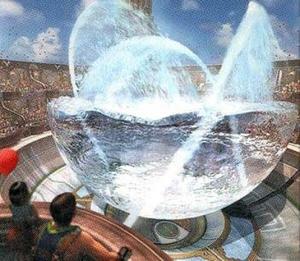 Blitzball matches in Final Fantasy X take place in floating water spheres. See the picture above. Absolutely no attempt is made to explain how they do it. Donkey Kong Jungle Beat had floating bodies of water floating in air that you had to swim through. Later, Super Mario Galaxy 2 re-used the same idea, adding games characteristic gravity tricks. Super Mario Galaxy has the Loopdeeloop and Loopdeeswoop Galaxies, which are Manta Ray race tracks made of floating water. The latter even has the water go uphill and in a vertical loop! The sequel has some interesting 2D platforming involving water passageways above, below, and next to platforms with gravity pointing any which way. Super Mario Odyssey has a variant. While not technically floating per se, Bowser's castle does have a swimming pool which is enclosed on only three sides, meaning the water is violating gravity in not dribbling out and into the void. In some ways, its even more uncanny looking than the usual variants of the trope, since it almost at first glance looks normal, until the Fridge Logic kicks in. Floating bodies of water are sometimes seen in the Kirby games. In particular, Kirby Super Star has a couple of blatant examples. In the first level of the Dynablade sub-game, an optional room has a perfectly rectangular space of water. The water-themed planet in Milky Way Wishes has other oddly-shaped bodies of water, with arbitrarily-placed pockets of air. Through use of the sponge block, it is possible to produce this effect in Minecraft. To a lesser extent, it can be done with signs and several other similar items. They allow you to pass through, but block the water. All the water in Riven: The Sequel to Myst is like this. The explanation is that the water contains a heat-avoiding bacteria that makes people sick when they drink it. Boiling it kills the bacteria and makes it ordinary water. The Angry Video Game Nerd famously lost his cool while playing Super Pitfall as the result of this trope. The forest level in The Legendary Starfy had numerous examples. A single-course setpiece obstacle in New Super Mario Bros. Wii: moving circles of water mixed in with the platforms. Yes, you can swim in them, and you can fall out of them to your death. The very first Turok game (the good one) had vertical columns of water that you had to ascend and jump out of at the top to scale a dungeon. Ditto one part of Clive Barker's Undying set in Oneiros. In the trailer for BioShock 2, a Big Sister uses telekinesis to make a big shield of water, for no reason other than to look awesome. This is a water rift from...well, Rift. One of the outdoor levels in Secret Agent has a block of water just floating in mid-air (that kills you instantly on touch.) There's no explanation for this. Apparently it's a level designer's error. Ni GHTS Into Dreams has a stage with floating bodies of water: the appropriately named Splash Garden. Rainy Clouds, which makes sense as clouds are filled with water. The Secret Exit route in Cat Beach is based around this particular gimmick. One false move and Luigi plummets to his death. In Tales of the Abyss, the capital of Malkuth is called Grand Chokmah, the Floating Capital, because most of it extends out over the surface of the nearby ocean. In addition to being filled with truly awe-inspiring fountains and waterfalls, the bar that you can enter has globes of floating water on display, suspended in midair as decor. Since Malkuth is the country known for its practitioners of fonic artes, it's safe to say A Wizard Did It to show off. Warcraft III's water can act strange, notably in Naga levels where two water areas are uninterrupted by land yet are at different height leves, connected by a ramp of water. Sometimes it's disguised by putting waterfalls over the ramp, sometimes not. Terraria: Can be accomplished with bubble blocks, which are impenetrable by liquids but otherwise intangible, allowing water (or honey, or lava) to be effectively suspended in mid-air and dived into from the sides or bottom. Lego The Incredibles: Dory travels on land in a bubble of water. 8-Bit Theater's take on blitzball is drownball, which Fighter handily wins by being the only player alive at the end (thanks to his brain not needing that much oxygen in the first place). SCP Foundation: SCP-791 is an inexplicably orb-shaped mass of water. This is the main principle of Waterbending in Avatar: The Last Airbender. Katara calls it "streaming the water". Aqualad of Teen Titans can do this too; he actually prefers to do this while he's in the water. In The Ren & Stimpy Show episode "Space Madness", Captain Hoark is in the bath and Space Cadet Stimpy turns off the gravity in order to calm him down. Cue this trope with the bath water taking the same rectangular shape as the bathtub. Truth in Television: In zero gravity, water will form floating spheres. These NASA videos shows a number of visually cool experiments involving them. And played for laughs in the Planetes manga: in an omake four-panel strip, Hachi sees a blob of floating hot coffee. Being cute, he sticks a straw in it and slurps it. Hilarity Ensues. And in the novel Simon Black in Space by Ivan Southall when one of the characters attempts to create a bath in zero gravity, and almost drowns in the process. Another way water does this in real life is in water droplets. When watched in a high speed camera it's revealed that the drop will float on the surface of the water as a perfect sphere for a fraction of a milisecond before bursting, launching a smaller sphere into the air which does the same thing until it gets too small to support itself. Technically, ice sculptures are this trope. Nobody specified liquid water, after all... By the same criteria, icebergs and clouds. Some decorative "dancing water" fountains simulate this effect, using continuous streams of water so smooth that they don't appear to be moving. Siphons can make liquids flow upwards using negative pressure. Due to urban air turbulence, it sometimes rains up around the Empire State Building's observation deck. With the magic of speaker pulses and video frame rates set in time with each other, someone has actually filmed a stream of still floating droplets, in this video .